Evidently I don’t like change, even when it doesn’t impact me directly. This insight into the inflexibility of my nature came upon a relative’s chronicle about a recent visit to Café du Monde. Our relatives reported that the venerable meeting place for cafe au lait and beignets in New Orleans’ French Quarter no longer serves hot beverages in their standard white mugs. 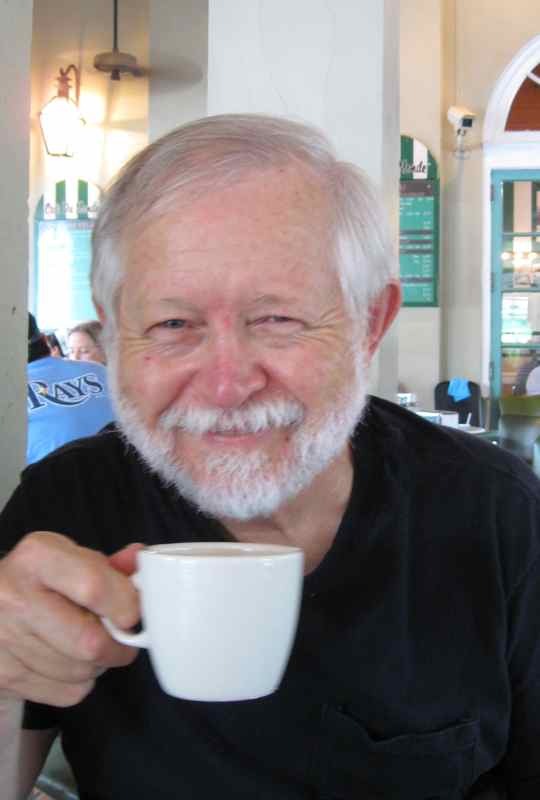 Our relatives’ coffee and hot chocolate arrived at their table in, gasp!, disposable paper hot cups. I haven’t figured out why that news distresses me. 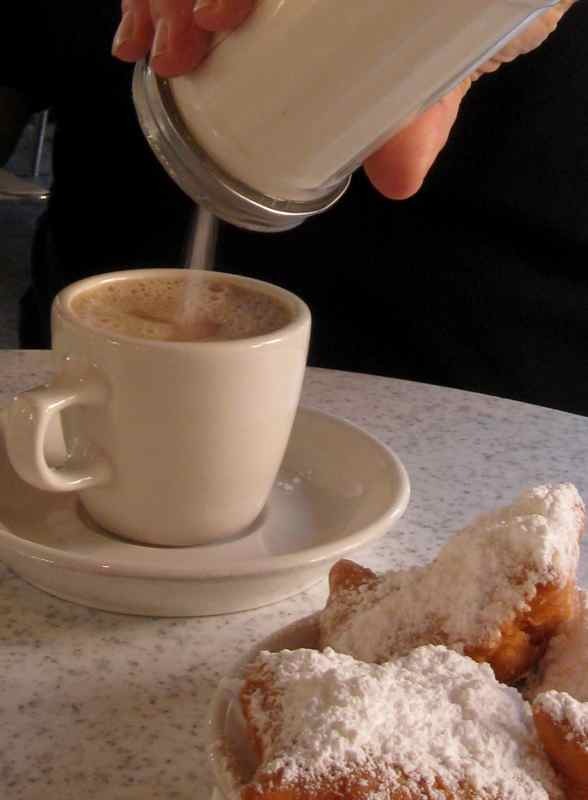 I don’t drink coffee and I rarely drink hot chocolate on our visits to Café du Monde, even in cold weather. My usual beverage is cold chocolate milk that I drink via a straw that I stick into the 8 oz. carton. So I have long been a part of the “use-it-and-toss-it” herd. 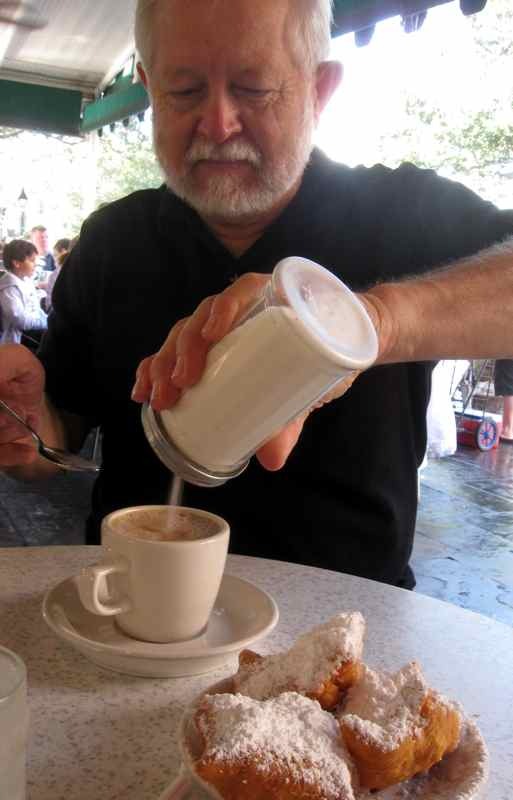 But I am convinced my beignets and chocolate milk are not going to taste the same when, across the table, husband Walter is adding sugar to café au lait that is in a paper hot cup. Looking at that cup of coffee reminds me I have not had a single cup this day. I might have to rememdy that situation here in a bit! It musta been good since you took three pictures of it. Those ceramic cups make the latte taste the very best. They make the beignets and coffee real not "fast food"
I loved mine in the cup when we had them there about 6 or 7 years ago. Those thick white ceramic cups always remind me of chicory-enhanced coffee at my grandmother's house. The mouth-feel of the cup certainly does something for the experience that a disposable cup is not going to do. Paper cups take the charm out of drinking coffees and chocolates from ceramic mugs. Just another sign of the times, where life is face paced!! I don't tend to order coffee at restaurants or fast food outlets, so this does not apply to me. Lol. Well!! I'm with you. I guess I'll have to carry my own mug with me! Change accompanying declining standards is always hard - but your pics look good, especially the pastries! I don't like most coffee from somewhere else. I like my home brew. The beignets look yummy, but not on my diet.. sigh.